This article and the following two will summarize prophetic similitudes of Messiah (the Jewish Moshiach) concerning the miraculous works of Prophet Elijah and his successor Prophet Elisha. Each prophet was given a dwelling place by a special woman whom God brought into their lives, and each left a messianic sign of God (Elohim YHVH) resurrecting their host’s son. These scriptural parallels are not mere coincidence, and in these articles I, Levi, will reveal how they fit within the prophetic, messianic, and panoramic picture of Christ’s redemption by God’s Old Testament Word, with implications and allusions that were orchestrated by God YHVH to confess His resurrection, and hopefully doing so will strengthen faith and comprehension for Jews and Gentiles. Not only do the resurrections written in the Old Testament’s (or the Jewish Tanakh) shadows profess that God has the power to raise His children from among Jews and Gentiles, but they profess a work in our days to resurrect Christ in many skeptical hearts before the Lord’s return for the Great Sabbath millennium. While Christians may not need another shadow of the Old Testament to confess the substance of Christ’s fulfillment in sacrifice, as most Jews do, they do need stronger roots in the foundational Word to strengthen and sustain their faiths as persecution of Christians and Messianics escalates in this apocalyptic end of the age. Not only that, but it is my hope that more Christians will awaken to the peculiar means in which God speaks in similitudes, parables, foreshadowing events, parallels, repetitive phrasing, riddles, word association, and prophetic symbolism to provide ample evidences of His panoramic and historical plan. After all, if only moral lessons are drawn from Old Testament stories for virtuous Christian living and prospering in this rebellious world, the Christian remains partially blind to what God is (and has been) doing in His works to establish His coming Kingdom at Israel. Not only that, but how can the learned Christian properly interpret their own messages given from Heaven, be they in symbolic visions or spiritual dreams of the night, or via some other means of the Holy Spirit teaching with enigmatic signs of everyday life, if they cannot discern most of the prophetic symbolism (which they should already be learning by) that are so familiar to readers of Scripture? Nonetheless, I will not dwell upon teaching the reader (as a pastor or minister might do), rather what I will do, as I do in all of my articles, is focus upon the panoramic picture, historical and prophetic, to profess the authenticity of Christ. Those who have their hearts opened to the Holy Spirit (Ruach haKodesh), and ears willing to hear how spiritual things correlate to earthly truths, can learn as they go by considering new interpretations of biblical stories. After all, Divine truths are shared among all who are prepared to receive such things, as drink to the spiritually thirsty, in servitude to the Great King Messiah and for the glory of the Creator of the universe. In the last article (see Lamb of Moriah), I explained line-upon-line how Isaac’s near sacrifice looked to Christ’s first arrival (something that many Christians already know), as a Son of the true Father (Abram) of Israel. In these next two articles involving Elijah and Elisha, I will continue upon that theme of the Son of God being raised in the hearts of the mothers, fathers, and their offspring into one faith- one people by Scripture as it shall soon be. In these articles, we will cover how crooked religious doctrines must be set straight to reveal the Son; with stumbling stones of theological erring over Christ cleared away; with tough things made smooth, to make plain a pathway; and with the prideful religionists and secularists brought down low as the meek valleys before God are exalted and raised to glory. Then, the Son will rise as the sun with healing in His wings to enlighten many new believers’ hearts (cf. Isa. 40:1-5; 49:11-13; 55:6-7; 62:10-12; 56:6-7; Mal. 4:2-6; Matt. 17:10-11; 24:32-33; Acts 3:19-21; Rev. 11:1-11). All the prophets of the Old Testament confessed Messiah in mysteries, as did many pagan religionists in a lesser degree with an essence of the will of God. The prophets under the Old Covenant prophesied to national Israel/Judah/Judea until John the Baptist (Yohannan). Then, exegetes of the New Testament scribed their correlations of Christ’s life and ministry to those ancient mysteries, which are being learned and taught to this day; these things will be finished with the work of Holy Moses and Prophet Elijah in Israel (a.k.a. Moshe and Eliyahu). In the simplicity of the carnally-minded, the sacrifice of Christ (Suffering Servant Messiah) is a small thing; after all, have not many noble souls given their blood, lives, and limbs in trials for righteous causes, in plights for justice and love? Although Christ was beaten nearly unrecognizable by Roman soldiers in Judea, and “marred more than any man” according to Prophet Isaiah (see Ch. 52, 53), have not others endured similar torture (and perhaps even worse) over the restless millennia of mortal bloodshed? Isaiah envisioned that Messiah ben Yoseph would be stricken and smitten for the sins and transgressions of Israel and all who would come to believe, but does that really mean that He carried all the sins and hurts of all who confess and believe? Was His blood so valuable as to make atonement for the whole world, of all who would turn back their hearts towards our God YHVH and His Word? The answer varies based upon whose perspective we accept while considering the cross (the tree that Christ was hung on as a curse for our redemption): God’s or Man’s? If the Messiah was merely another man of sins, sin would dictate that He thereafter died for His own struggles and transgressions against God. But, as we have studied from the moedim shadows, especially the spotless lambs for Pesach- with the New Covenant professions of His disciples and even Pontius Pilate that no sin was found in Him- our mortal perspective must shift to God’s view of the sacrifice rather than that of skeptical secularists and religionists. 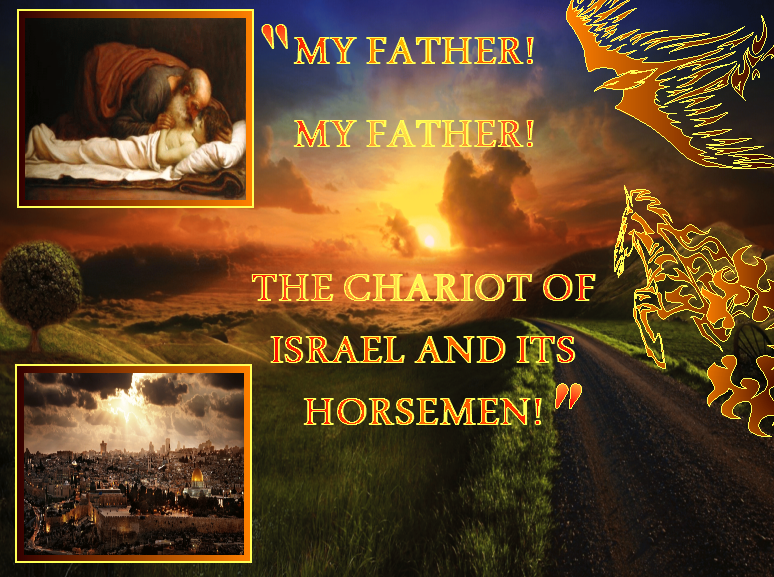 Why will the mourning be so great all over Israel when Messiah returns? Because for nearly two millennia Jews have listened to their rabbis blaspheme Yeshua haMashiach, the manifestation of Immanuel (God among us), who is the Son of God. And many Jews have joined in, calling Him YESHU- an acronym for let his name be blotted out (i.e., omitted from the Book of Life). Indeed, a profound awakening in coming to all of Israel, and many Jews who do not heed Moses, Elijah, the Holy Spirit, and Scriptures will be cast out of the land by the King Messiah, and those who are left will mourn for what they have done to our Elohim YHVH, who considers the blood of His beloved Son as His own. All Israel will then be saved, with all twelve tribes restored for His Holy Kingdom, although not all who are there will remain, and not all who are called of Christians will be brought in. Thus, when the Truth is revealed to all people at the return of Messiah, those who have embraced Christ, among Jews and Gentiles, will indeed have joy for Him (but sadness for having not done more), and those who have been obstinate for their religious and/or secular worldviews, when given a chance to learn (only correctable after the fact), will have great sorrow. But Jerusalem will be the praise of the earth, filled with the blessed. It is extremely important that more Christian teachers learn the Scriptures and the basics of relevant sciences for teaching- not remain mere zealots of a faith who cannot back their beliefs with sound reasoning and Holy Writ. We should be willing to battle in love on every front possible rather than cower before religionists, secularists, rabbis, and ministers who pride themselves in preserving their exclusionary religious beliefs or humanist ideas at the cost of biblical Truth. We need not be aggressive, but we should be prepared to defend the Truth with scholarly knowledge of the Bible, and great comprehension of prophecies, for the sake of awakening those who are willing to learn. Too few rabbis confess the Messiah Yeshua, and most Jews are left in the dark because of wrong ideas about Christ and/or because of their religious/racial (cultural) pride, and (believe it or not) some via jealousy of Christ. In fact, fewer Jews than ever even believe in Elohim YHVH as the Father/Creator, primarily because so much rabbinical nonsense and mysticism have driven them to atheism (approximately 68% here in America according to a 2012 Pew Research poll) in this age of skeptical science. Too few Christian and Jewish teachers and scholars have an in-depth knowledge of Scripture, and they cannot defend the biblical texts with reasoning, which leaves most Jews and billions of Gentiles completely undiscerning about the soon arrival of Messiah, and how Scriptures have professed Him and the appointed times millennia before His arrival. Also, there is a justifiable fear on the Jewish part: fear of losing their cultural identity (Jewishness) after fighting for survival during many centuries of the Diaspora, often from the hands of zealous and prideful Christians teaching violence against them (e.g., Martin Luther). Most Christians, although they have faith in what they know of Scriptures, have failed to discern God’s panoramic plan concerning the Jewish nation (see Rom. 11), and because of this they have given themselves the authoritative role of Elijah (to turn back Jewish hearts) rather than humbly teaching those whom the Lord YHVH has called to them. Often, their attempts at conversion, especially via the Roman Catholic religion, have been through violence and harsh rule over them, even casting them out of nations (e.g. Spanish Inquisition of 1492). Hence, Christians can be bold in faith, but the Scriptures and the Spirit must make the case for Yeshua, at least until there is no more time and Moses and Elijah are revealed with signs and wonders, martyred in Jerusalem of Israel. Many rabbis have taught that Jews must surrender their Jewishness if they become Christians, which is a blatant falsity, so those who do know the Scriptures must reveal Messiah through the Word (Old Testament, their Tanakh) and knowledge while not insisting on changes to Jewish religious culture and heritage. After all, Christ and His apostles were devout Jews, and Christians have as much work to do in discovering their roots as Jews do in spreading spiritual fruits on the messianic branches. In the next two articles, following this introduction, two Old Testament foreshadowing similitudes will be disclosed to show the legitimacy of Christ’s sacrifice for all of His people. One will focus upon the Messiah dying for Hebrews, particularly Jews, and the other for the Ekklesia (Called-Out Assembly among Gentiles and lost tribes). In Scriptures, there are two main households in God’s redemptive plan: the House of Judah from the southern nation (mostly Jews, Levites of the priesthood, and some Benjaminites who did not go into Assyrian Captivity c. 722 B.C.) and the House of Israel of the northern nations (which includes the rest of scattered Israel and those who are adopted into the commonwealth of the nation for the coming reign of Messiah). The House of David looks back to the time before Israel and Judah divided into two nations, with two different destinies, and it (the kingdom of all of Israel) will be fully restored under the Messiah, with the borders of the nation expanded to fulfill the promises. Although the New Covenant has been embraced by Gentiles and many people from the lost tribes of Israel, and we await a national Jewish awakening to the truths in Christ, we will begin our exegeses with the latter story of Elisha’s dealings with a prominent married woman of Israel (symbolic of the Jewish people) before the former story of Elijah providing for a Gentile woman.